BANGI, March 24, 2014 – The National University Of Malaysia (UKM) in particular the Institute of the Malay World and Civilisation (ATMA) needed to step up efforts to ensure the Malay language plays a dominant role in nation building. 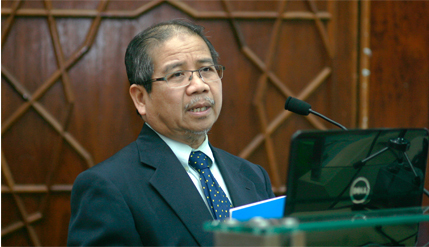 Director General of Dewan Bahasa dan Pustaka (DBP) Datuk Dr Awang Sariyan said the country’s leaders must be consistent in their stand to uphold the language so that the role of the national language does not fade away as the people become pre-occupied with globalization. Delivering his public lecture on The Role of Language in Human and Social Development organised by ATMA here today, he said the national language should not be sacrificed in the name of development and progress for real headway includes the ability to advance the Malay language and culture. All Malaysians should uphold and strengthen it not only as the official language but as the language of science and other fields of knowledge. Dr Awang said the position of Malay as the official and the language of science is one of the terms of the country’s social contract that must not only be maintained but enhanced. It is provided for under the Federal Constitution through Article 152 and strengthened by a number of Acts of Parliament including the National Language Act, the Education Act and the DBP Act as well as the implementation of the national language policy . The National Education Policy at its core also enshrined its use as the main medium of instruction. Unfortunately, Dr Awang said there are signs indicating that what has been provided for may not be achieved in the near future. “There are now people especially the non-Malays who do not want to use it while even the Malays seem reluctant to use the language,” he lamented quoting the efforts of certain quarters to make the English language as the medium of instruction for Science and Mathematics in secondary schools as an example . Dr Awang also observed that a number of universities are moving towards using English for important courses just to attract international students. Dr Awang called on the mass media to play a greater role in upholding the Malay language by setting a good example for the people to follow. Prof Dr Nur Hashimah Jalaluddin, who had just been appointed Director of ATMA succeeding Prof Dr Abdul Latif Samian who is now the Principal Research Fellow at the Institute also attended the talk.